The Geodynz-sud cruise on board the R/V l'Atalante collected bathymetric, side-scan sonar and seismic reflection data along the obliquely convergent boundary between the Australian and Pacific plates southwest of the South Island, New Zealand. The survey area extended from 44°05 S to 49°40 S, covering the transition zone between the offshore extension of the Alpine Fault and the Puysegur Trench and Puysegur Ridge. Based on variations in the nature and structure of the crust on either side of the margin, the plate boundary zone can be divided into three domains with distinctive structural and sedimentary characteristics. 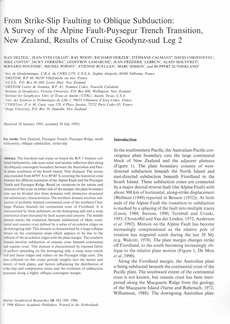 The northern domain involves subduction of probably thinned continental crust of the southern Challenger Plateau beneath the continental crust of Fiordland. It is characterized by thick sediments on the downgoing slab and a steep continental slope disrupted by fault scarps and canyons. The middle domain marks the transition between subduction of likely continental and oceanic crust defined by a series of en echelon ridges on the downgoing slab. This domain is characterized by a large collapse terrace on the continental slope which appears to be due to the collision of the en echelon ridges with the plate margin. The southern domain involves subduction of oceanic crust beneath continental and oceanic crust. This domain is characterized by exposed fabric of seafloor spreading on the downgoing slab, a steep inner trench wall and linear ridges and valleys on the Puysegur ridge crest. The data collected on this cruise provide insights into the nature and history of both plates, and factors influencing the distribution of strike-slip and compressive strain and the evolution of subduction processes along a highly oblique convergent margin.